This event site is within minutes of exit 26 New York State Thruway on the well traveled Rt 5 Amsterdam road along the scenic Mohawk river. Available is a large pavilion, grass fields and tons of space for parking. Looking for a GREAT event venue, contact us for rental information. Check out the dog events...meet the newest family addition! Antique, Collectibles & Craft Festival! June 11, 2016 Spring Fling NEW DATE!!! Interested in being a vendor at our Spring Fling? 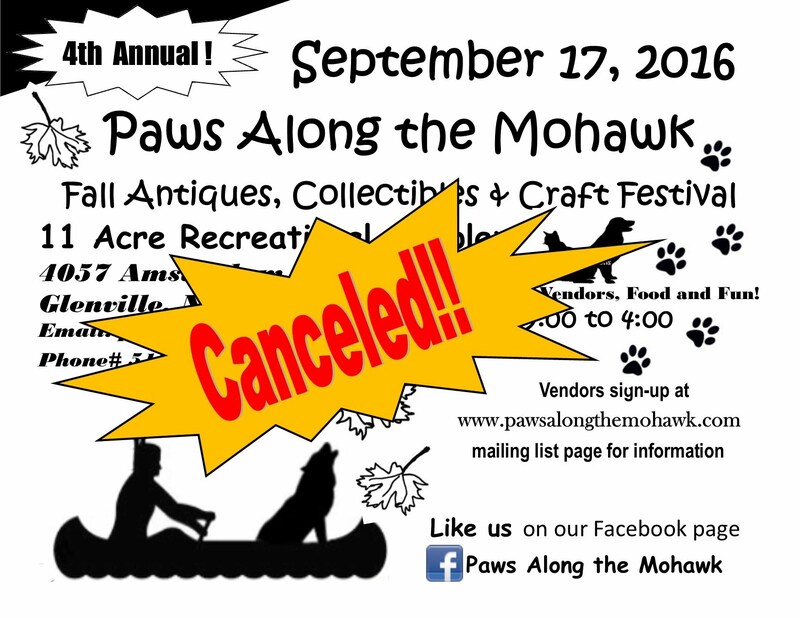 Sign up on the mailing list page or email us at pawsalongthemohawk@gmail.com Expecting a GREAT season!! Spring Fling Antique, Collectibles & Craft Festival! What a great day! Thank you to all of you that joined us! Thank you to all who participated !!! Check it out at the link here! Located on scenic Rt 5 in Glenville N.Y.
Subpages (1): Follow Us on Twitter!